For some smaller, rural organizations that run domestic violence shelters, those decisions are already being made. Help In Crisis, a domestic violence service that runs a shelter with around 30 beds in rural Oklahoma, has begun to cut back on certain services in order to limit expenses, including a housing assistance program that helps women transition out of shelters. The organization, which is located close to Cherokee Nation headquarters complex, serves four counties within the state, and many of their clients include Native American women. “We’ve already had to really curtail housing assistance, which is going to leave people in our shelter a little longer,” said Laura Kuester, the executive director of Help In Crisis. “Which unfortunately means there’s not space when people need to come in. It’s supposed to be a revolving door, but it’s going to hold everything up. 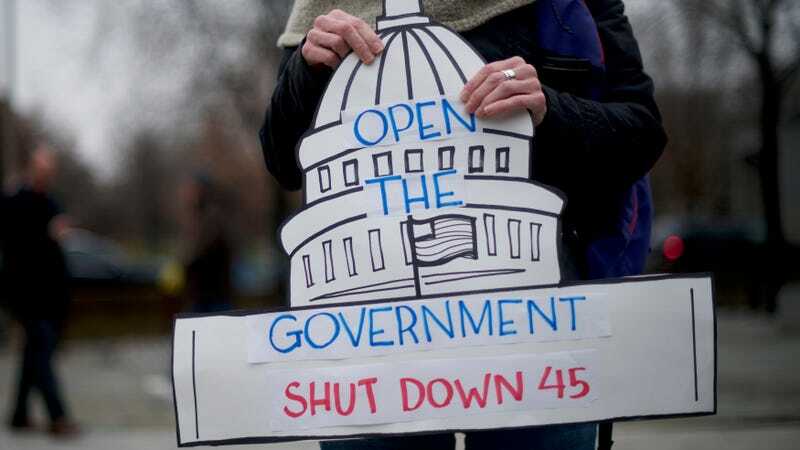 The scary thing is telling people we can’t help them.” Kuester estimates that their emergency reserves, which they’ll have to dip into in about a month if the shutdown continues, will only last them for another month. Because the employees who work at the Department of Justice who release the funds were furloughed, the checks couldn’t go out. The DOJ was able to bring some employees back to work to process the payments on January 7, but that is a band-aid at best. The department has told providers that it has enough money carried over from prior years to flow funds only through January 17. It’s also not clear whether enough DOJ employees are back on the job to process all of the frantic requests for reimbursements. Kuester estimates that at least 80 percent of Help In Crisis’s budget comes from federal grants. Twenty out of 27 of her employees, who she says are already overworked and underpaid, have their salaries funded by the federal government. Kuester says she will do “absolutely everything” necessary to keep the shelter running for as long as possible, but the situation will only worsen as the shutdown drags on. More isolated, rural shelters already face a number of unique issues that are compounded by the shutdown. Because they’re located outside of Tulsa county, Kuester says, Help In Crisis doesn’t have access to large foundations and corporations that would normally donate to organizations like theirs. And since the shutdown, they’ve been depending on the local community to donate day-to-day consumables, like soap and toilet paper, but that won’t cover essential needs—like staff salaries—to keep all the programs running. Already, shelters in rural areas are often few and far between. According to one study conducted by professors at University of Iowa, over one-quarter of women in rural areas in Iowa lived over 40 miles from the closest domestic violence service. Transportation, in areas where there is no public alternative, can be a big barrier—and an extra expenditure for programs—to getting women the help they need.